Passez la journée à vous détendre dans les piscines thermales lors d’une excursion d’une journée aux sources chaudes de la vallée de Lares. 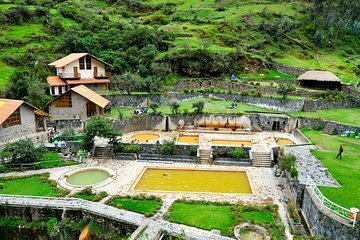 En partant de Cusco, vous vous rendrez dans la verdoyante vallée de Lares pour explorer le complexe de sources chaudes, abritant quatre bassins de températures variables. Réputées avoir des propriétés cicatrisantes, les eaux enrichies en minéraux sont censées soulager les douleurs musculaires, osseuses et articulaires. Le déjeuner, les rafraîchissements, ainsi que les transferts depuis et vers l'hôtel sont inclus. This was an awesome day!! Richard waa a terrific tour guide and driver. The journey along snake road was pretty narrow, long and had lots of curves but it was worth the soak in the thermal springs in Lares. We had a delicious lunch of fresh trout with vegetables and rice- delicious!! Richard was a wonderful guide and this was the absolute high point of my three weeks in South America. The drive was beautiful and quiet and quaint. Richard had an immense interest in and knowledge of the people, the area, the customs, the history, the archeology, etc. It's a double edged sword to be honest about this tour because it was so extraordinary partly because there were no tourists, nothing frantic, nothing stressed or chaotic, unlike all the other major archeological sites around Cusco and the Sacred Valley. If you want to spend a day seeing incredibly beautiful vistas, mountains, people, towns, forests, produce, etc. with a wonderful wonderful guide this is not to be missed. This tour was the experience I had dreamed of having in Peru, in contrast to the somewhat phrenetic and chaotic feel of the tourist packed sites that are taken as almost mandatory. The hot springs were wonderful and we got to have a wonderful picnic lunch looking onto such a lovely scene it made me warm inside with the feeling of being so fortunate as to have that moment. Additionally, the road to the hot springs is beautiful, but a little treacherous and at times downright scary. It added greatly to the experience and Richard is a great driver and we enjoyed a lot of laughs over some white knuckle moments. I can't think of a single even mild criticism. This was wonderful and I feel super lucky to have gotten to take this tour. If you want on the beaten path, familiar, known, or just are not that interested in the natural world or rural, not in the tour books, places, you might not enjoy this as much as I did.